“Thirty-five years ago, the countries of the United Nations announced the annual International Day of Peace to commemorate and strengthen the ideals of peace. That declaration said that since wars began in the minds of men it was in the minds of men that the defenses of peace must be constructed. 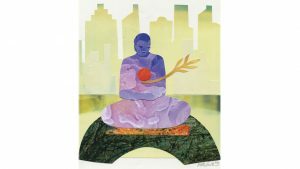 Despite the awareness that peace must first be conceived within the individual for it to endure everywhere—from the inner life to the outer—deep-rooted passions still provoke heady disputes within and around us, plaguing us, our relationships and even nations in their affairs.